Rachel Spark is an irreverent, sexually eager, financially unstable thirty-year-old college instructor who moves back home when her mother is diagnosed with terminal breast cancer. As she tries to ease her mother, a perpetually cheerful woman, toward the inevitable, Rachel turns from one man to the next—sometimes comically, sometimes catastrophically—as if her own survival depended upon it. Ella Bloom, an adult student in Rachel's poetry class, has aspirations beyond her work at a local family planning clinic. But she spends her nights wondering why her husband kissed one of her colleagues and whether it will lead to a full-fledged affair. She is also preoccupied with one of her repeat patients, Georgia, a teenager whose frequent clinic visits speak volumes. What they all have in common is their desire for love, despite its many obstacles. 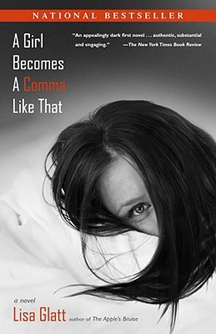 A Girl Becomes a Comma Like That is a novel rife with wit and compassion. A provocative, assured new voice in literary fiction, Lisa Glatt eyes the yardsticks by which we constantly measure our world and ourselves—devotion, lust, forgiveness, and courage.